A very short summary of the profession of type making is in order. From Johannes Gutenberg through Simon de Colines, the earliest creators of typefaces were printers who doubled as punch cutters. The ﬁrst punchcutter who was not also a printer was Francesco Griffo da Bologna who cut punches on commission for Aldus Manutius and Girolamo Soncino. In the 16th century independent punchcutters, such as Claude Garamont and Robert Granjon, began to appear. These individuals did not cut punches solely for speciﬁc printers, but instead sold strikes or matrices of their work to many printers, often at trade fairs. In the 17th and 18th centuries the business of some independent punchcutters grew to the point where they took on employees and opened small shops selling types. This was the case with the Voskens family in Amsterdam and William Caslon in London. By the middle of the 19th century some of the type foundries had grown to the point where they were major businesses, often occupying a city block or more. For instance, by 1875 MacKellar, Smiths & Jordan in Philadelphia took up five city lots and employed approximately 300 people. The large foundries had punchcutters on staff such as Hermann Ihlenburg who is credited with designing and cutting over 80 typefaces for MSJ. This was the situation in the 1892 when twenty-three American foundries merged to create the American Type Founders. In 1900 Morris Fuller Benton was made head of ATF’s Department of Typographic Development, the ﬁrst individual—as far as I know—to be responsible speciﬁcally for overseeing the design of typefaces at a type foundry. In essence, Benton was a staff type designer as opposed to a staff punchcutter. This subtle difference was the result of the invention of the pantographic engraver by his father Linn Boyd Benton in 1884 that made it possible to cut punches mechanically. The Benton pantograph engraver allowed type foundries to work from enlarged drawings of letters. Not surprisingly, the Benton pantograph engraver was partly responsible for the emergence of the artist type designer toward the end of the 1890s as type foundries began commissioning typefaces from well-known commercial artists. The ﬁrst of these were Otto Eckmann (Rudhard’sche Schriftgießerei, 1900), Eugène Grasset (Fonderie G. Peignot et ﬁls, 1900) and George Auriol (Peignot, 1901). This was the world of type making when Goudy began his career with the design of Camelot in 1896 for the Dickinson Type Foundry. There were still independent punchcutters such as Edward Prince—famous for cutting types for William Morris and nearly every important British private press of the time—and staff punchcutters such as Charles H. Beeler, Jr. at MacKeller, Smiths & Jordan and Charles E. Heyer at Barnhart Brothers & Spindler. But the future of type making lay with type designers rather than with punchcutter, with individuals who drew letters to be pantographically cut rather than with those who physically cut the punches as in the days of Gutenberg and Jenson. Goudy was the most important of this new breed. At the beginning of his career Goudy designed typefaces as an outgrowth of his work as a lettering artist. In this he was no different from Eckmann, Auriol, Otto Hupp, Peter Behrens and a host of other commercial artists in Europe and America. None of these individuals was a type designer per se. With the possible exception of Rudolf Koch, Goudy is the only one of this generation—or of the succeeding generation—to go on to devote his career to type design. Between 1902 and 1911 Goudy designed many of his typefaces not for type foundries but for businesses. He pioneered the idea of the custom or bespoke typeface with his work for the Pabst Brewing Company, the clothier Kuppenheimer & Company, Mandel Brothers department store, ﬁnancial news publisher Clarence Barron, Baltimore printer Norman Munder and, most importantly of all, book publisher Mitchell Kennerley. * Essentially Goudy took the notion of the private press typeface inaugurated by William Morris and extended it beyond the insular Arts & Crafts community to the larger world of commerce. Kennerley, the typeface designed for The Door in the Wall by H.G. Wells (published by Mitchell Kennerley, 1911), was the turning point in his career, the moment when type design began to overtake lettering and private press printing as his principal activity. Kennerley typeface. Detail from A Door in the Wall (1911). Kennerley, pantographically cut for Goudy by Robert Wiebking, was signﬁcant because it was a typeface in the Venetian old style manner, but it was not a revival of Jenson or of any other incunabula roman. It was an original typeface that avoided the still influential Art Nouveau and Artistic Printing tendencies. There is truly nothing like it from any contemporary American or European foundry. The popular typefaces from ATF were Franklin Gothic, News Gothic, Cheltenham and Bodoni. In England the newest thing was Windsor (Stephenson Blake, c. 1905); in France there had been nothing new since Auriol; and in Germany the types were either blackletters, grotesques or Jugendstil faces. 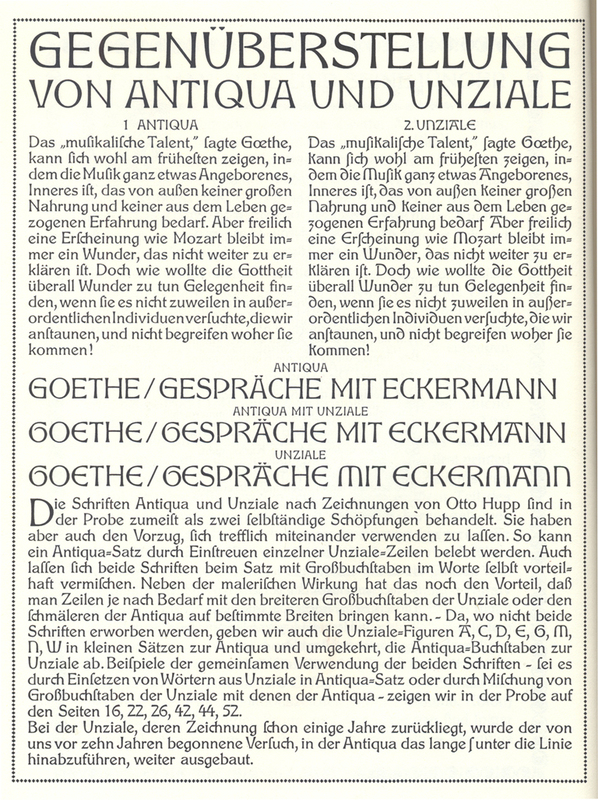 The most exciting German antiqua was Feder Grotesk by Jakob Erbar (Ludwig & Mayer, 1910). ** Kennerley preceded Hollandse Medieval (1912), Imprint (1913), Plantin (1914), Centaur (1914), Koch Antiqua (1922), Tiemann Antiqua (1923), Weiss Antiqua (1926) and Perpetua (1925–1930). 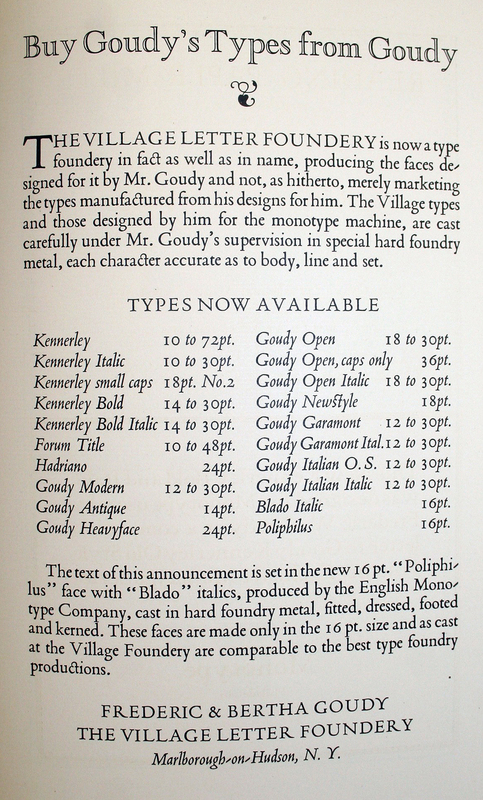 As important as Kennerley was, the typeface that cemented Goudy’s reputation among contemporaries and that is still in wide use today is Goudy Oldstyle (ATF, 1915). Despite the truncated descenders that disﬁgured the face in Goudy’s view—they were done to make the design conform to ATF’s “common line”—it is still an astonishingly handsome design, especially when seen in its original foundry incarnation printed letterpress on good paper. Morris Fuller Benton expanded Goudy Oldstyle into a huge family that became enormously successful; so much so that ATF issued a special supplement to its 1923 specimen book devoted solely to it. Even by that date there were few typefaces that could challenge Goudy Oldstyle for quality. ATF Garamond, issued in 1917, was going gangbusters but Stanley Morison’s vaunted type revival program at Monotype Corporation had only just begun with Poliphilus (1922), Monotype Garamond (1922) and Monotype Baskerville (1923). 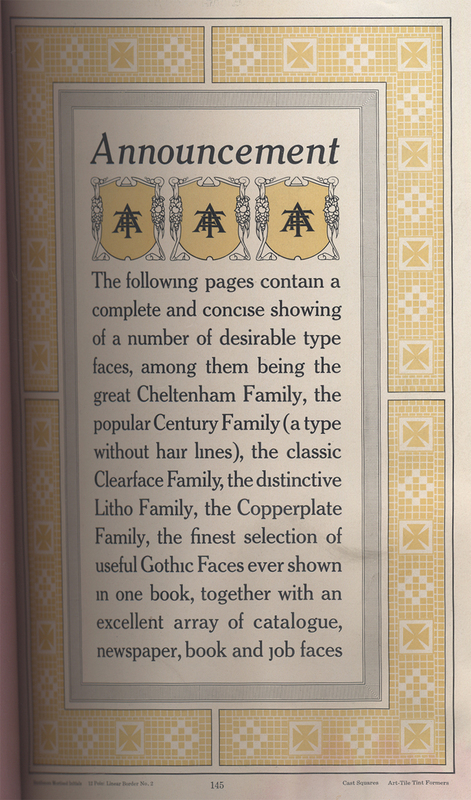 None of these, of course, was an original design as was Goudy Oldstyle or Kennerley. 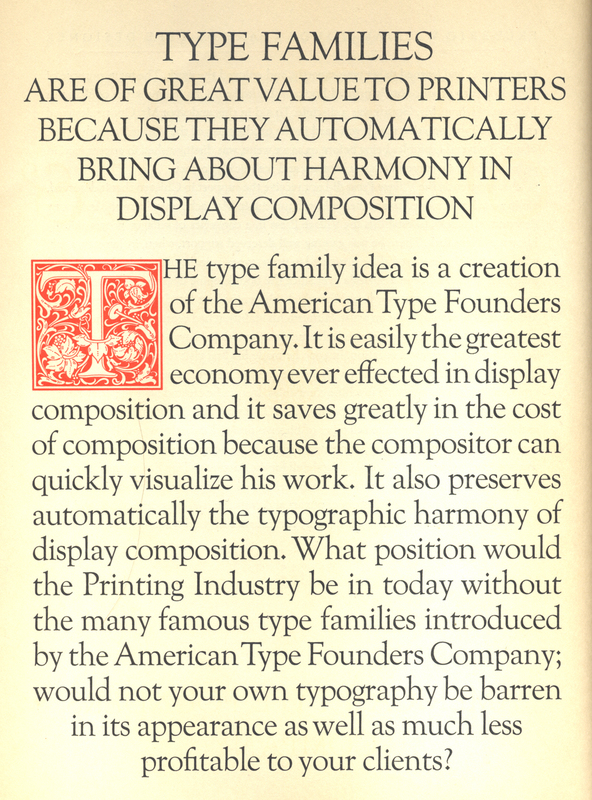 “Type Families” from The Goudy Family (American Type Founders, 1923). In 1911 Goudy changed the name of his Village Press, the private press he had established with Will Ransom in 1903, to the Village Press and Letter Foundery. 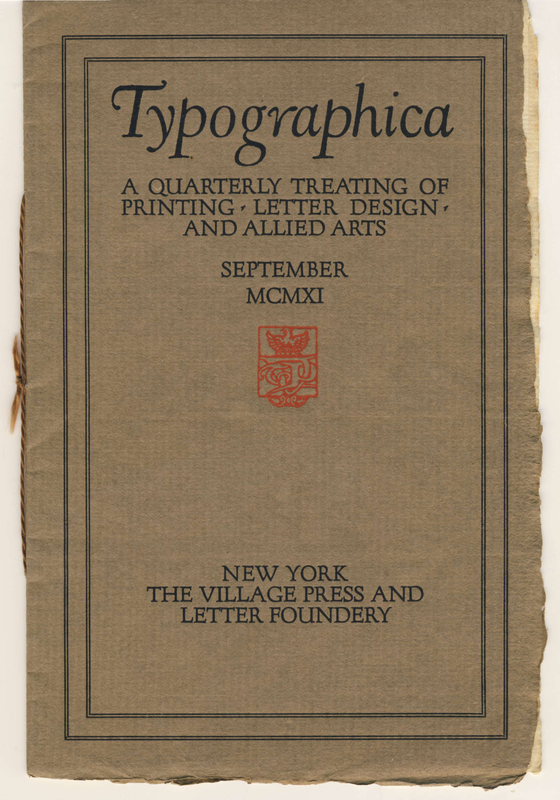 The name change appeared as the imprint for the ﬁrst issue of Typographica: A Quarterly Treating of Printing, Letter Design and Allied Arts, issued in September of that year. (Goudy came in for a lot of ribbing for his archaic—and to some pretentious—spelling of “foundery”.) The magazine contained an essay—really a manifesto—entitled “On Letter Design” by Goudy which opens with these words: “To attempt a revision of our letter forms as expressed in types is to set one’s self a difﬁcult task, requiring patient waiting for tangible results and recognition. There is to be met and resisted the possibility of ridicule, the accusation of egotism from the unthinking, of obstruction even, by those whose commercial instincts may be touched. We have reached the turning of the ways. If there is to be revision someone must lead. Letter design no longer lives as an artistic craft. To restore the craft to its original purity of intention and make it once more alive is to go back to the very foundations of typography.” It was set in Kennerley. Typographica no. 1 (September 1911) published by The Village Press and Letter Foundery. Title handlettered by Goudy with remainder of text set in Kennerley. With this statement Goudy challenged the type foundries, calling them out for wasting their time basing new types on the latest artistic trend, whether it be aestheticism or Art Nouveau; or commissioning new types from “artists” such as Eckmann, Grasset and Auriol. His alternative was a return to types made by someone with a deep knowledge of lettering and its history. In other words, a return to classical, Renaissance forms. In the American printing world of 1911—mired in a mix of 19th century didones, Victorian types, pirated William Morris designs and pale Art Nouveau offerings—Goudy’s notion was revolutionary. Hupp-Antiqua and Hupp-Unziale by Otto Hupp (Gebr. Klingspor, 1910). From Atlas zur Geschichte der Schrift 7 (2001). Kleukens-Antiqua by F.W. Kleukens (Bauersche Gießerei, 1909). From Atlas zur Geschichte der Schrift 7 (2001). “Announcement” in American Specimen Book of Type Styles from American Type Founders Company (1912), p. 145 (detail). In Typographica no. 1 Goudy included an advertisement for his new venture. It stressed custom type designs: “Mr. Frederic W. Goudy is prepared to design and cut for any Advertiser or Printer a distinctive type face for his exclusive use, and solicits commissions of this character. Any design of his will be simple, legible and characteristic.” Goudy had set himself up as a boutique type foundry, decades before the term was invented to describe the small digital type foundries that now dot the landscape. Goudy was aware of how radical it was for one man to run a “type foundry” in the aftermath of the massive ATF merger and the consolidation of foundries taking place in England, France and Germany. In 1914 he issued his ﬁrst type specimen, entitled A Novel Type Foundery: A Dissertation on Type Design and the Village Types Together with a Specimen of Types, Borders and Ornaments, etc. (1914). Advertisement for Goudy typefaces in Typographica no. 1 (1911). 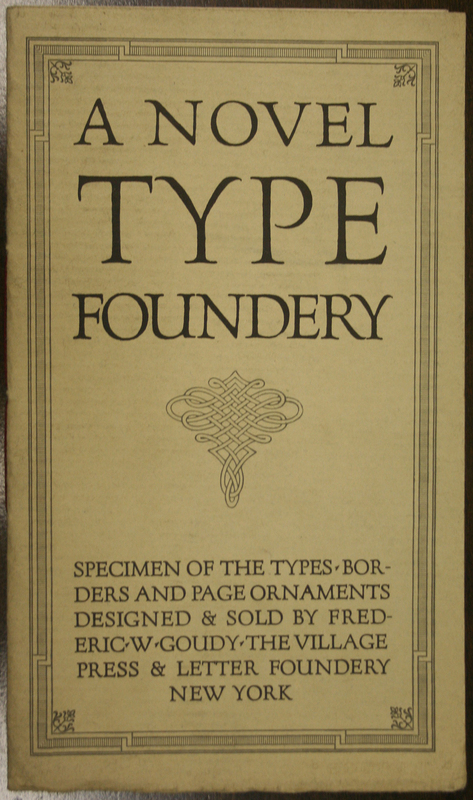 A Novel Type Foundery (1914). Type specimen cover. Title handlettered by Goudy. Although he continued to do a fair amount of hand lettering during the ensuing decade, Goudy had, in effect, become a professional type designer as opposed to a commercial artist—like T.M. Cleland or E.R. Weiss—who, on occasion and on request, designed typefaces. The promotional, drum-beating aspect of his type specimens, his publications (the journals Typographica and Ars Typographica, and the books The Alphabet and The Elements of Lettering) and his articles for the trade was essential to his economic survival. What Goudy was doing was indeed novel and he had to scare up customers to commission him to design typefaces and to buy his designs, even when issued by the major foundries, from him instead. Thus, in 1921 he issued a specimen which included a list of his latest designs—among them Goudy Garamont and Goudy Italian, both released by Lanston Monotype—with the heading, “Buy Goudy Types from Goudy”. 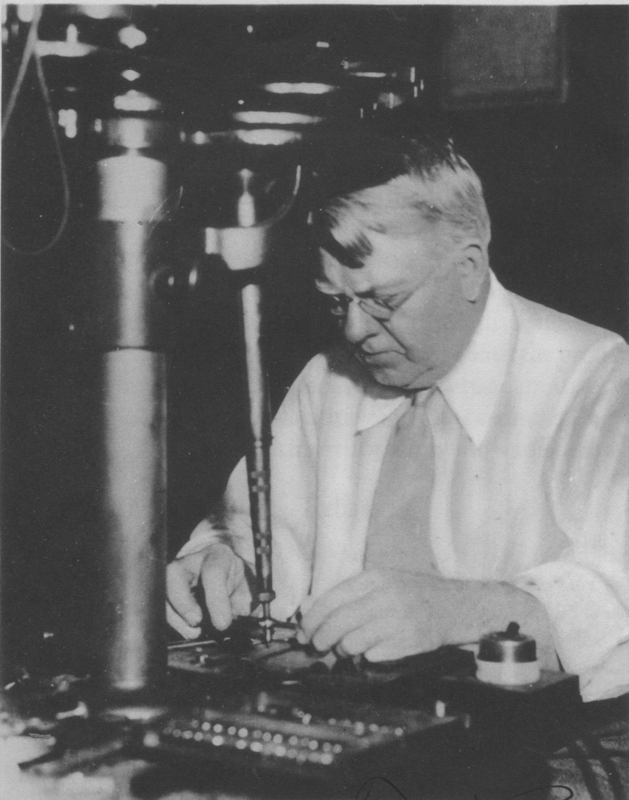 Goudy at the matrix engraving machine. Photograph from Ars Typographica vol. II, no. 1 (1925). Although there is no defense for the nauseating hero worship that many lavished on Goudy in his lifetime, there is a straightforward defense for Goudy’s own self-promotion: economic survival. Without it the Village Letter Foundery would never have lasted for thirty-six years. Unlike Morison, who had the sales resources of the Monotype Corporation and the publicity efforts of Beatrice Warde to sell the fruits of his typographic program, Goudy had only himself and his wife Bertha in the early years. In this he was in the same position as the plethora of small digital foundries today who use any means available—print magazines, blogs, Facebook, Twitter, etc.—to promote their typefaces. Goudy was not the ﬁrst type designer to have a typeface named after himself—that honor may go to Will Bradley—but he certainly was the most proliﬁc. This means of promotion originated with ATF, responsible for naming Goudy Oldstyle and Goudytype, and was enthusiastically adopted by both Lanston Monotype and Continental Type Founders. Goudy clearly relished the attention that having typefaces named after himself brought. But to see this naming as merely an act of egotism and criticize him for it—as both Updike and Morison did—is to ignore the reality of the modern marketing of type. Since the 1890s type foundries have increasingly used the fame of their type designers to sell their wares: Eckmannschrift, Weiss Antiqua, Gill Sans, Schneidler Medieval, ITC Novarese, Frutiger, Veljovic Script and so on. 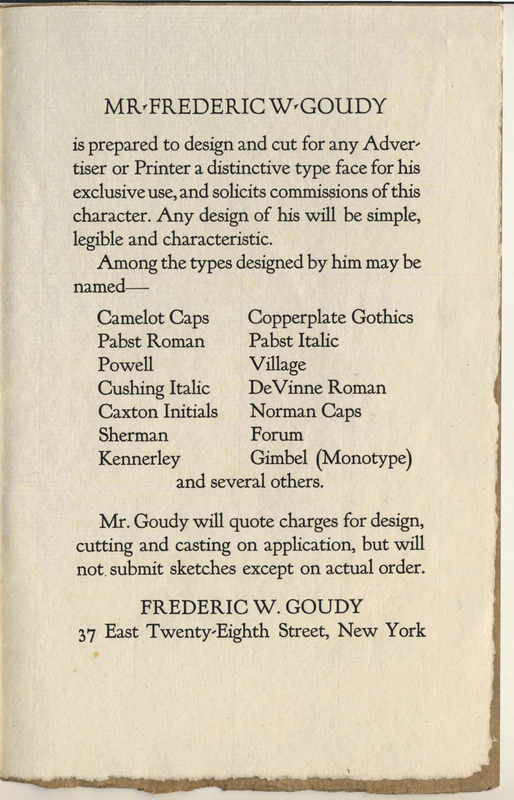 Goudy’s name was an intrinsic part of insuring that printers—the principal buyers of typefaces in his day—associated designs with him and not with the Village Letter Foundery, ATF, Lanston Monotype or Continental Type Founders. It was an exercise in branding that also helped him attract the individuals, businesses and institutions that commissioned him to design private types for them—which he invariably named after them rather than after himself. Thus, Record Title for the Architectural Record, Spencer Old Style named for the dean of the School of Journalism at Syracuse University, and Scripps College Old Style. “Buy Goudy’s Types from Goudy” advertisement from Typographica no. 5 (1927). Note that eleven of the 18 faces by Goudy listed have bear his name. He sold Poliphilus and Blado, made by the Monotype Corporation, as well. Goudy’s struggles—beyond the two disastrous ﬁres that destroyed his business—and successes should be celebrated by today’s font designers rather than denigrated and sneered at. One doesn’t have to like his typefaces or even the man himself to recognize that he was an important pioneer in the history of type design.° The only other full time type designers during his lifetime were all on staff: Morris Fuller Benton at ATF, C.H. Griffith at Mergenthaler Linotype, Sol Hess at Lanston Monotype, Alessandro Butti at Nebiolo, Rudolf Koch at Gebr. Klingspor, Heinrich Jost at Bauer, and Hermann Zapf at Stempel. And the other type designers of the time were commercial artists—book designers, typographers, letterers, illustrators—ﬁrst and type designers second. This includes Bruce Rogers, Oswald Cooper, W.A. Dwiggins, Rudolph Ruzicka and T.M. Cleland in the United States; Eric Gill and Berthold Wolpe in England; Cassandre in France; S.H. de Roos and Jan van Krimpen in the Netherlands; and a long list of Germans (among them Peter Behrens, Walter Tiemann, E.R. Weiss, F.H. Ehmcke, Lucian Bernhard, Paul Renner, F.H.E. Schneidler, and Herbert Post). This is still the situation today as only a small percentage of the thousands of individuals designing fonts do so as their principal means of earning a living. Those who do so should see Frederic W. Goudy’s career as an inspiration. *Goudy’s work in this area was preceded by Theodore Low De Vinne who designed Century Roman for The Century magazine in 1895. It was cut by Linn Boyd Benton at ATF. 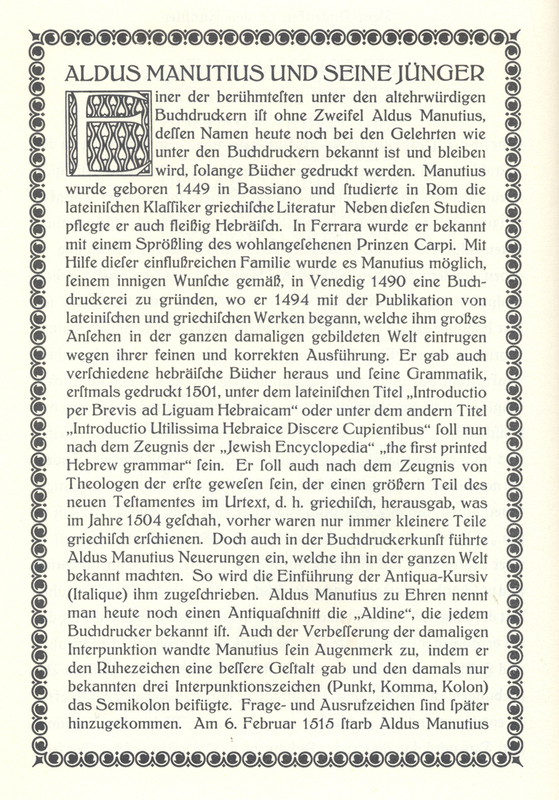 **See the Schriftenchronik in the Klimsch Jahrbuch for 1912. ‡American Type Founders boasted about Goudy Oldstyle: “It is a real triumph in an earnest effort to produce a classic and versatile type face that is equally ‘at home’ when used for the modest visiting card, the digniﬁed letterhead, or the most pretentious catalogue or booklet.” (Advertisement in The Pacific Printer, vol. 16, July 1916, p. 222). The boast was quickly justiﬁed by the widespread popularity that immediately greeted the typeface, leading ATF to turn it into a full fledged family. Goudy Oldstyle brought the aesthetics of the Renaissance book to advertising. °Many of the inconsistencies and flaws in Goudy’s types are surely the result of his situation as a one-man operation. He had no Morison, Griffith, Lange or Aaron Burns to provide feedback and criticism of his efforts. In this Goudy is also the forerunner of the great majority of today’s font designers whose efforts are often less than they could or should be because of the same lack of outside input.